From COL Danny McKnight, National Spokesperson of Operation Safety 91, to Ed and Mary Ganster: "Thanks to both of you for what you are doing for our special people, all those First Responders. A special thanks to you from Linda and I for letting us be a part of something so awesome, terrific and truly special. We want to send our love and warmest regards to the two of you at this very special time of giving thanks, Happy Thanksgiving!!" Chief O'Neal and Minneola Firefighters joined Operation Safety 91 at New Hope Christian Academy to celebrate Thanksgiving with a huge Turkey Dinner with all the trimmins'! Students broke out into spontaneous applause as the Firefighters entered the Lunch Room. Right in the middle of dinner, the Firefighters received an alarm, so OS91 delivered their dinner right to the Fire Station. NHCA and OS91 appreciate you, Chief and Firefighters of Minneola FD! We thank God for you this Thanksgiving. Thank you for keeping us safe! Faith Harvest Church warmly welcomed Clermont Fire Chief Carle Bishop with his Firefighters to a Turkey Dinner with all the trimmins'. Ed Ganster joins them at table as they enjoyed Thanksgiving Dinner. Operation Safety 91 appreciates all at Clermont Fire Department so much! Thank you to Faith Harvest Church for their love of Responders! "My church held a special service to honor our local responders on September 11th. Several companies of our fire department and some of the off duty firefighters attended the service at which I brought the message. Everyone who attended received a copy of "Psalm 91 - God's Shield of Protection," one of the Psalm 91 pocket cards and a lapel pin. Everyone was very appreciative and several of the firefighters have spoken to me privately to say how much they appreciated the service and the recognition of their efforts. We attended the Federation of Fire Chaplains' Annual conference in Alexandria, Louisiana last month. Boxes of God's Shield of Protection were distributed to the attendees.... I have had the opportunity to distribute Psalm 91 books and cards to a number of police officers and state troopers in the course of my travels. I am also reaching out to other fire departments in our area and in surrounding counties...."
This story is true and all about "making a difference"! Several months ago, Ed and I traveled to Clanton, Alabama, at the gracious invitation of the U.S. Corps of Chaplains National Commander, Chaplain Phil Burnette for their 7th Annual National Conference. God gave us some powerful Chaplain connections to reach Responders at that Convention itself, as well as at a Restaurant where twice we ate dinner! The youth on the far right (pictured above), was our waiter. Mason was extraordinary...always addressing us as "Sir" and "Ma'am". Of course, Ed and I were dressed in our Operation Safety 91 dress shirts, which soon became the topic of conversation. Mason immediately caught the cause of OS91 and got an idea. We exchanged contact info and said good-bye. A couple of weeks later, after we returned to Florida, we reconnected with Mason and he requested the plastic Psalm 91 cards and the Psalm 91 books for Military for the local Firefighters of Clanton. 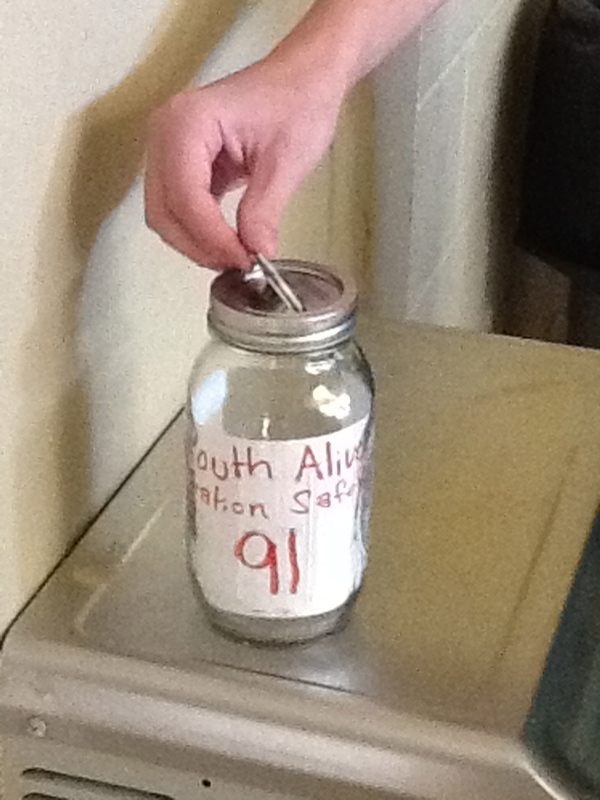 Then, all on his own, with no help from us, Mason shared Operation Safety 91 with his Youth Group, "Youth Alive", and got them on board taking up donations at their High School to help us make more plastic Psalm 91 cards for Responders. The result? $286!!! Translated: that is nearly 3,000 Psalm 91 cards which will be given free to Responders all over the U.S. and Afghanistan! 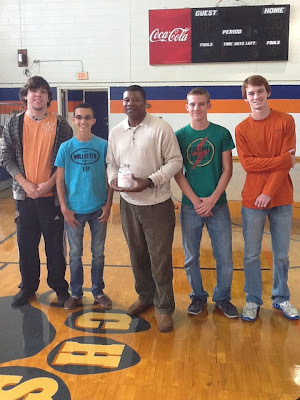 Pictured above are members of "Youth Alive" from left to right: Hunter, Nicholas, winning classroom teacher Coach "T", Stevie, and Mason. A most heartfelt Thank You to all these special High School students, especially Mason, whose vision and generosity extends to the Responders who will receive the Psalm 91 cards! Mason said: "I had a ton of help from the other guys in 'Youth Alive' and the cooperation of the faculty at my high school...they were a HUGE help! This really means so much to me. It's just awesome to be used by God to help you help Military and Responders...so humbling too. " Operation Safety 91 commends you all and we hope that your commitment will be shared by many more youth and adults in the future. God bless you! That's what one youth with a vision can do!!! COL McKnight shared so many wonderful stories with us: stories of Divine Connections, talks with those who wanted to share their hearts in private, of those who needed encouragement and of those who so very much believe in what they are doing. COL McKnight is so humble, and so willing to help our Troops in any way he can. We believe Operation Safety 91 is truly blessed by God to have COL McKnight as our National Spokesperson! This Veterans Day, OS91 Chaplain partner, Chaplain Fred Wilcoxson invited Ed and Mary Ganster of Operation Safety 91 to a phenomenal Dinner Concert called "America We Must Not Forget" put on by Church of the Messiah in Winter Garden, FL. This concert conducted by the extraordinarily gifted Music Minister of Church of the Messiah, Dave Gillium, was outstanding to say the least! Specially honored at at this Event were local heroes and "Home At Last" recipients, U.S. Army SPC Marcus Griffin and SSG Jeff Kelly with their devoted wives and families. Thank you to Pastor Tom Rutherford, Dave and all who do such a wonderful annual Presentation to honor our Veterans, and thank you to Chaplain Fred for the invitation. We loved every minute! A most heartfelt and sincere THANK YOU from Operation Safety 91 to all our Veterans for all you have done for us! Your sacrifice and heroism has preserved our way of life and our precious freedoms. We appreciate you, love you, and pray for you daily! In recent weeks as police chaplain here in Satellite Beach and pastor of Our Father's House, I've met with Responders from the 45th Space Wing USAF, the 920th Rescue Squadron, USAF, the Satellite Beach Fire Department and the Satellite Beach Police Department. ALL of these Responders wanted their men and women to have this resource. Perhaps the most heart-warming meeting was with the chaplain of the 920th Rescue Squadron, USAF, Chaplain Matt Simpson, USAF Major. His men deploy into the hottest war zones on the planet to do rescue ops. When I placed in his hands several boxes of the military edition of Psalm 91, plus the OS91 cards, he was visibly moved. Many of his men are in harm's way on a regular basis and on deployment in Afghanistan with 12 hours on twelve hours off ready to respond to emergency rescues and evacuations as well as assist civilian casualties. He told me this story of a helicopter pilot who has been praying Psalm 91, who had a round of machine gun fire go through his cockpit right by his head...no injury and a safe return to base!!! Hallelujah!!! For me personally, this testimony has touched my heart the deepest. A 10 year Navy veteran in his early 30's who is part of our ministry has been battling stage 4 cancer. He has a young wife and a one year old son. We began together the Psalm 91 prayer and full on study of the promises. He has been through two major surgeries plus chemo and radiation. The whole church prayed Psalm 91 over he and his wife last month. Yesterday he was at Moffitt for new scans. PRAISE THE LORD...he is almost completely cancer free. Most of the cancer markers are completely gone and the few remaining ones are greatly reduced...YES...no pestilence remains...diseases die...JESUS WINS!!! One of the things I've observed over these past few months is the fear that seems to grip the spouses of those who are deployed. We are addressing this fear head on with Psalm 91.